We caught up with Fabio Dipinto to celebrate the completion of his Via Francigena documentary ‘I Volti della Via Francigena’. Fabio kindly agreed to do an interview about the film, the places and his experience of the Via Francigena in Italy. 1. When did your passion for film-making begin? I always appreciated cinema. It is a unique language to communicate in and can make people dream. I cannot recall a specific date when the passion began. Maybe my direction met cinema without any effort. It started as a bit of a game but I have a real passion to tell fascinating stories. 2. 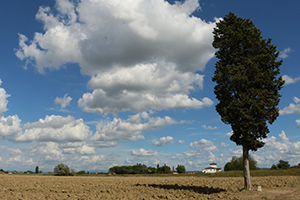 Why is the Via Francigena so special to you? I did my first Camino, the Camino de Santiago in 2012. It was a rite of passage. That experience was so unique and filled with emotion and meaning. I learnt so much about myself in a period of my life when there was very little certainty. I understand that the Camino means a change for people but it is also the chance to listen to yourself and at the same time discover and be free. Being able to experience all of this in your own country on the Via francigena is something very special and difficult to describe with words. The walk is a very special chapter of my life. 3. What film makers and films have inspired you? I don’t have a specific movie or specific director but I watch lots of movies. I wanted to start this trip and this movie without having any specific scheme to follow and to get inspiration from so that my mind could be free and I could work off my instinct. But if I really need to name someone it would be Werner Herzog who is a great example and inspirational to me. 4. 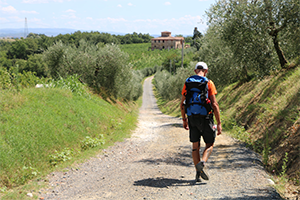 How many sections of the Via Francigena route have you walked? For the movie I walked all of the Italian sections from Colle del Gran San bernardo to Rome, 1,000 kilmetres in 6 weeks. I filmed everyday walking, meeting people and filming breathtaking places. 5. 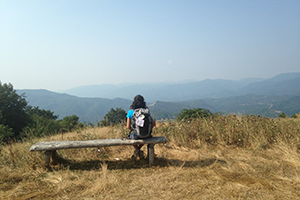 In your opinion, why would you encourage people to experience the Via Francigena? In all of my travels I have very rarely found so much beauty as I did in the places on the Via Francigena; in the small towns and in the bigger cities so full with history. These places are fascinating and everyone should see them at least once in their life time. To do it, you need to do it walking because walking offers a unique vision of things and only walkers can have that experience. 6. 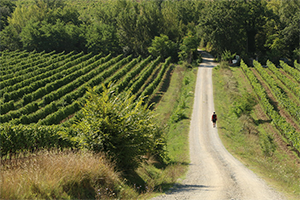 What made you pick the Via Francigena pilgrimmage route as the subject of your film? It was a mixture of destiny and coincidences and it was in my head for a long time. I wanted to tell the meaning of a Camino but I always thought it was difficult to convey. When I got the opportunity to co-operate in the maintenance of the signage on the route I took it and that is when I started filming. 7. You walked for six weeks while shooting the film, what were your favourite places and why? There are so many that it difficult to choose one because from Colle de Gran San Bernardo to Rome there are a number of places that are in my heart. On the webpage of my movie ‘I Volti della Via Francigena’ you can visit my photo gallery where I have put photos of my favourite places on each stage. The picture I have included here is a favourite of mine because this day was particularly difficult, both physically and mentally, but I felt a strong energy here and it helps me to start walking again and become full of life. It was like taking a very cold shower, rejuvenating. It gave me the right energy to walk again with a smile on my face because nature has a powerful impact on me. 8. Now that the film is complete, do you wish to release it outside of Italy? If so, will you provide subtitles? I would love to bring the movie out of Italy and I am working on it. I wish I could tell in person eye to eye what it means to start a walk and all of the positive emotions that this can bring to everyone. The movie is already in English subtitles so it is ready to distribute abroad. 9. The music chosen as the theme tune for the film is wonderful. How did you choose this theme and why? I love the soundtrack too. I personally know Andrea, the pianist that composed the music and he has done other compositions for movies. I think a pianist in a concert hall interprets reality through music and these romantic visions always fascinate me. I proposed to Andrea to be in charge of the soundtrack and he accepted straight away. We got on very well from the beginning and that is why it turned out so well. Andrea watched the movie and afterwards was inspired by the images and transferred his feelings into music. 10. You say in your description of the film that the “Via Francigena is a great opportunity for Italy and for all of us”. What do you mean by this? How do you feel this film can support this spectacular route? The Via frangiena is a great opportunity for Italy and all the people that could work around the places. I think Italy’s great artistic and cultural patrimony could only live through tourism but nowadays it doesn’t happen and I hope that this movie passes the message that the Via Francigena can make a big difference in everyone’s life and at the same time it can be a way for Italians and foreign people to get to know these fantastic places. 11. You interviewed many people who have walked sections of the Via Francigena, what were their main reasons for embarking on the Via Francigena journey? During the filming process I interviewed more than 40 people and then I chose 25 of those for the movie. I had the opportunity to interview not only pilgrims but also walkers, hosts, volunteers, historians and clergy. A very diverse range of people that give life to the route. The reasons why people start walking are very different. Some do it for faith, some they see it as a personal experience, some just want a diversion, some are looking for answers, others are asking questions, some people want to be on their own and more in contact with nature. So there are millions of reasons and everyone is unique and each has there own reason why. 12. What was the best part of the filming experience? You know what, I am almost sure that the best part is yet to come. I am sure that promoting the movie to both people who are interested and those who are sceptical will be the best moments when I can reach satisfaction. All of the filming experience was amazing and I have learned a lot from every single moment of this journey. 13. What are some of the challenges you faced when filming along the route? It was very difficult to film because I was walking for more than 40 days and I had to film everyday, sometimes under very warm sun. I want to share a difficult but hopeful moment. The day before a bank holiday by mistake I deleted all of the content on the hard disk where the movie was stored. I was desperate and I tried my best but I couldn’t get the files back. At that point I wanted to go home and leave the project. I really needed an IT guy but it wasn’t possible on a bank holiday but then something magical happened. I met Roberto, a guy on the way, I explained what I was doing and what had happened to the files and it turns out that he was an IT expert and found all of the files. I am very grateful for this guy. 14. 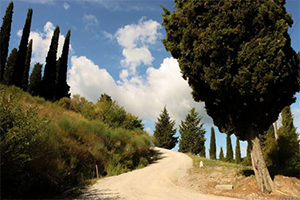 Do you have any tips for people hoping to walk a section of the Via Francigena in the future? Giving advice is not my strength but I can suggest three things; a very light backpack, a good pair of walking shoes and a book that you have always wanted to read. The first two things will help your body to bring you to the end of this adventure and the last will make your trip even more memorable.